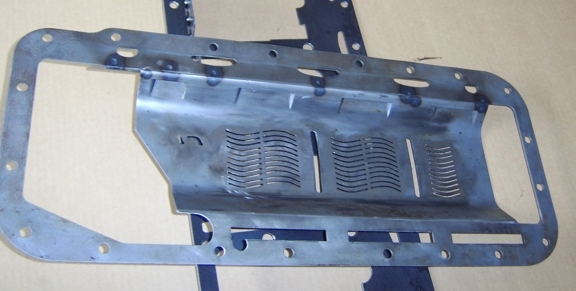 A standard "Eclipse" type pickup tube was sectioned and positioned closer to the pan floor to increase the G-rating of the sump as well as to allow the Mopar anti-vortex dimples to function properly. The tube was reinforced with two straps. 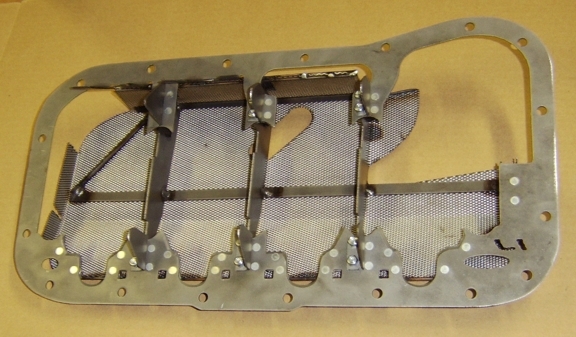 The windage tray assembly was modified in a number of ways to fit the interior of the pan. A dipstick guide was included that works in tandem with the guide present in the pan. 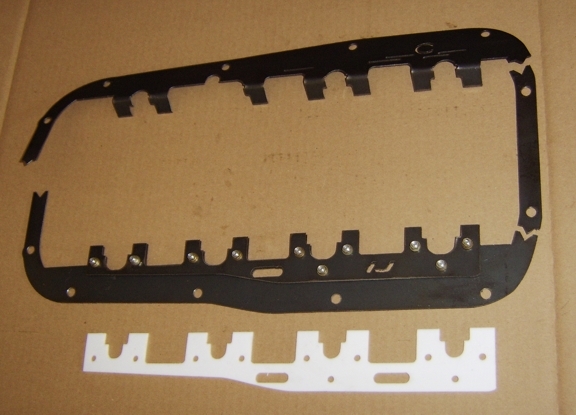 Steel or Teflon bladed scraper for Fiat 1100 "Fire Engine"
Dual scraper for Alfa Romeo straight fours. 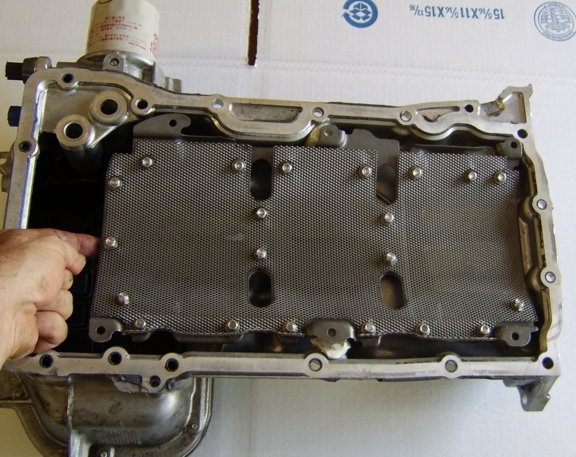 Two liter stroke shown. 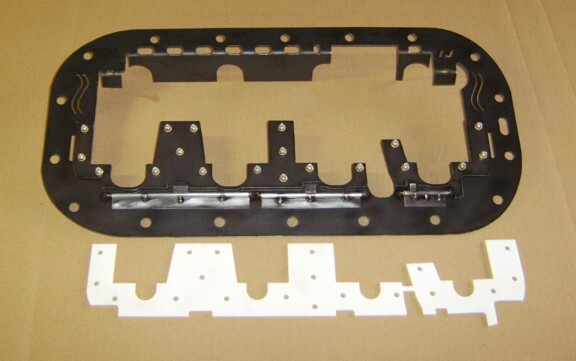 Compatible with many dip stick locations, OEM and aftermarket windage trays. Many thanks to Pete Exton for his extraordinary help with this design. 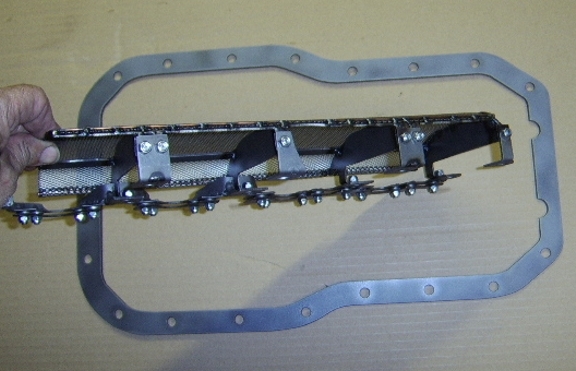 This jig holds the bedplate of the engine in the correct relationship with the pan (951 pan shown). 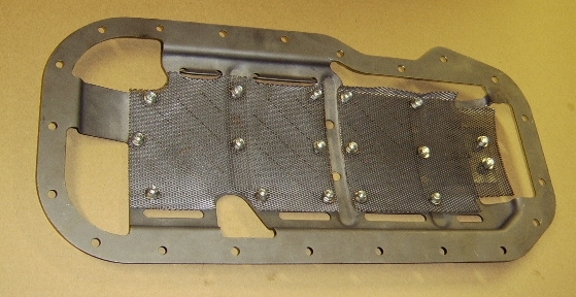 The windage tray assembly and scraper nest with no modifications needed to the pan. 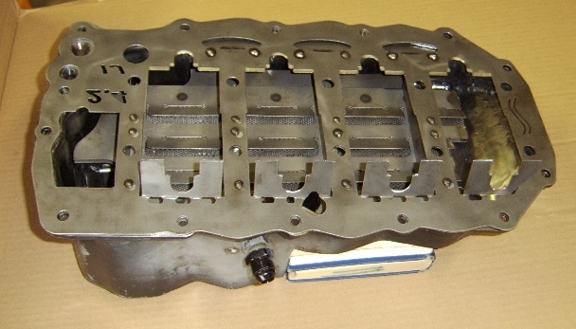 Mopar A, LA racing downstroke scraper with directional screening and adjustable scrapers. 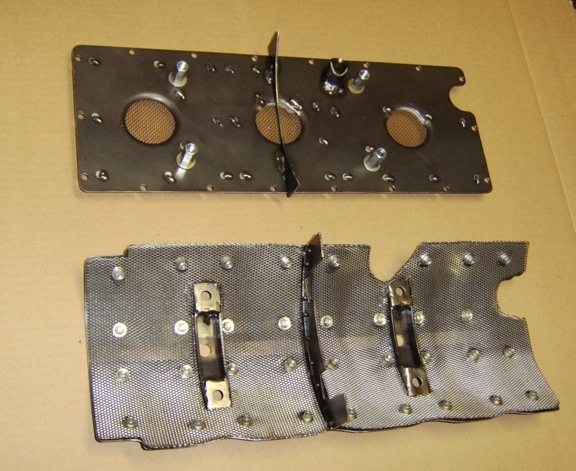 This pattern was specifically developed for use with aftermarket halo girdles on two bolt main blocks. 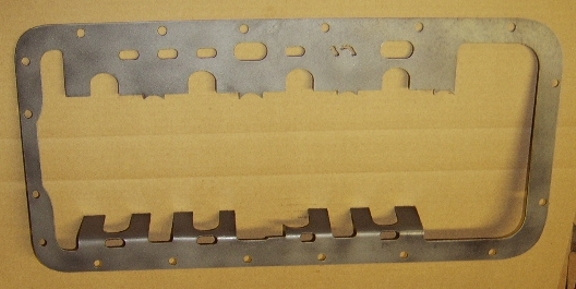 SBC scraper for late LT1 -- thick steel to use with sectioned one piece gasket (Fel-Pro shown); can be used with two or four bolt mains. Also available without dipstick hole and with different strokes. 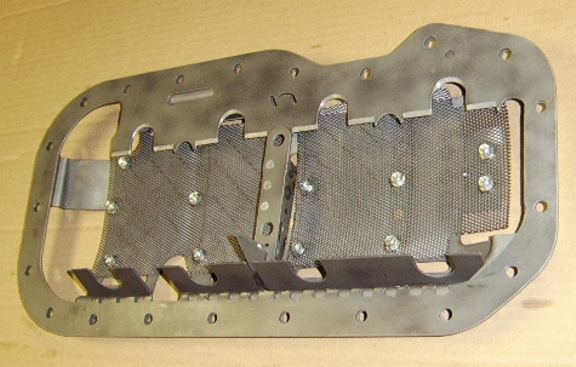 Updated full directional screening windage tray for SBC, including late LT1. Provisions for two and four bolt mains. We have received feedback and dyno testing indicated that the combined system below significantly improved the output of the stock engine from 4400 rpm, peaking at over 3.5% gain at 7500 rpm. 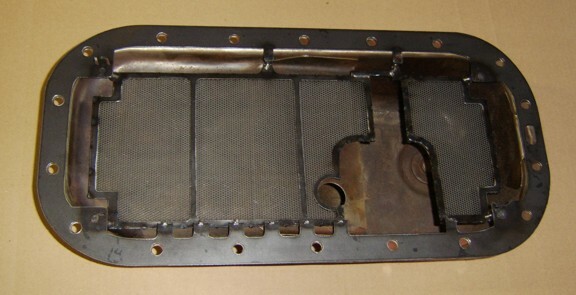 Studebaker V8 windage tray with adjustable louvers and directional screening; this is a copy of the factory R series tray but with louvers and screening added -- it is welded into the stock pan. 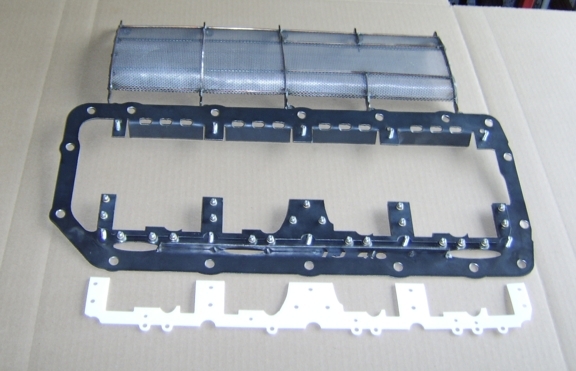 Modified factory 4AGE tray -- directional screening is added to the interior to dissipate the energy of high speed oil droplets. 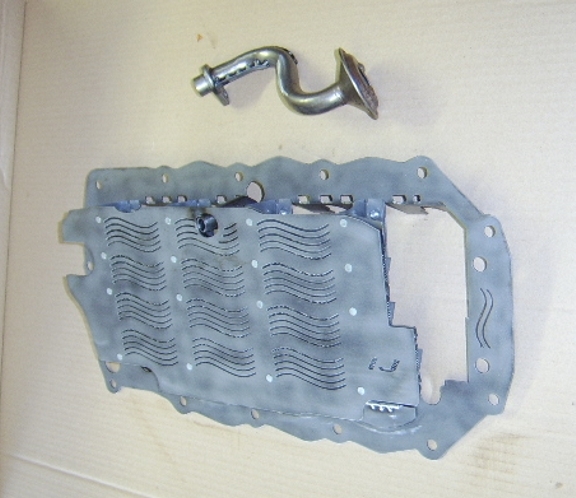 The border and tray is sectioned to match the 20v oil pan rail and drainage is added. A 20v Teflon bladed scraper is also shown that works in harmony with the scraper. The scraper is for a custom crankshaft that has been knife-edged. 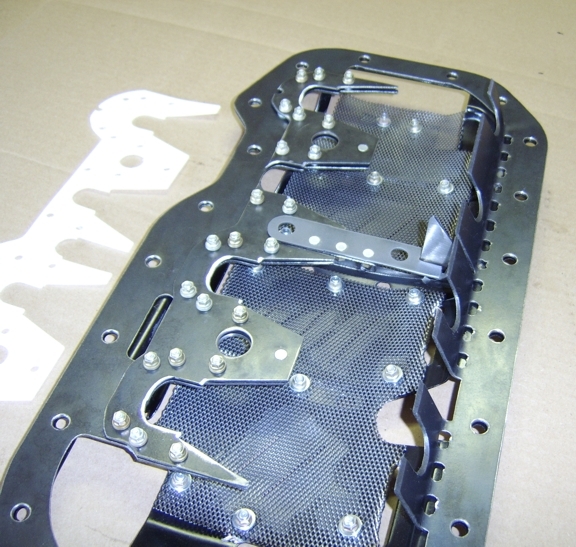 The downstroke scraper has drainage shields to protect oil from windage as it proceeds to the pan floor. 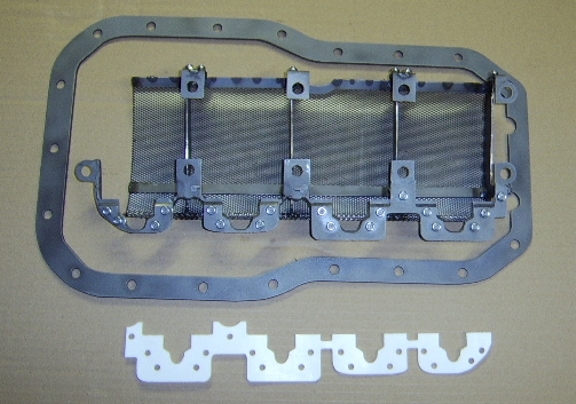 Directional screening windage tray for 4.6 Rover with steel pan (enquire about similar trays for earlier engines). 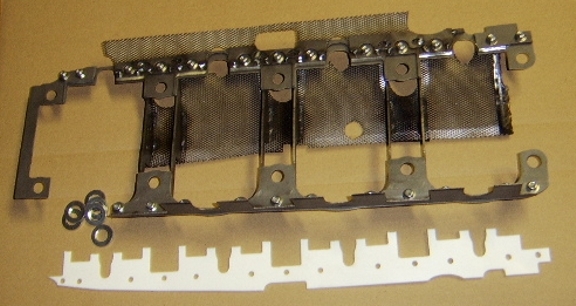 The tray attaches to separately available dual scrapers. 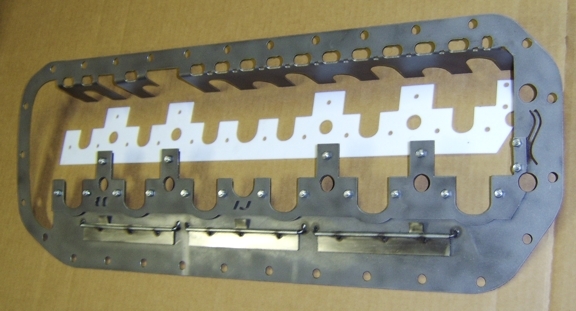 The windage tray has drain ports added and an interior layer of directional screening making it a dual layer tray. 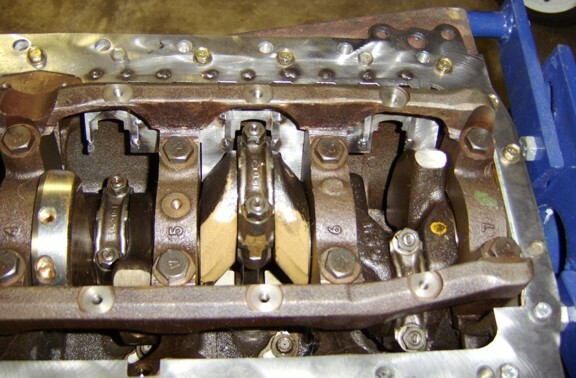 The modifications vary depending on the block style and type of crank scraper it is working in harmony with. 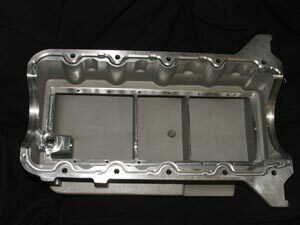 The lower tray seals the casting thereby creating a surge baffle as well and provides three major drain holes for oil returning to the sump. 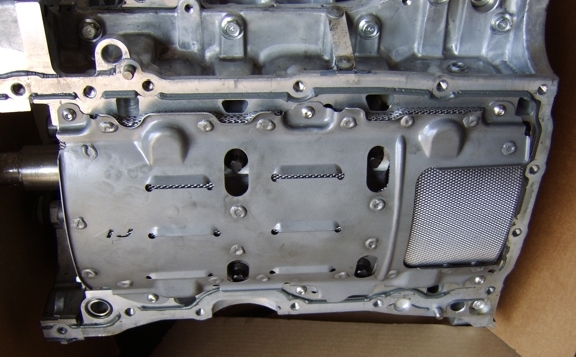 The small remaining hole is to allow the factory dipstick to pass through. 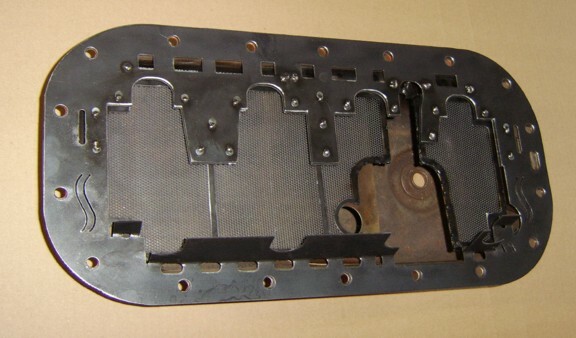 The pressed curved tray on top is a Ford item (the design varies). 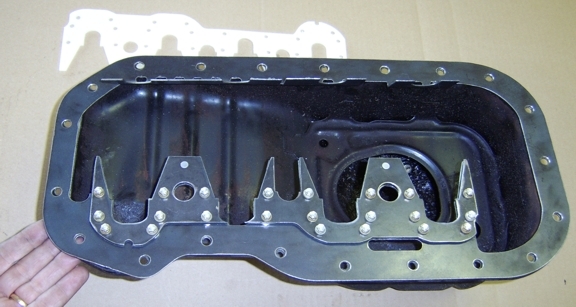 The Ford tray has a smooth metal interior that allows oil droplets to strike it and bounce back up and be struck repeatedly by the rotating assembly. The energy lost in this way can never be recovered. 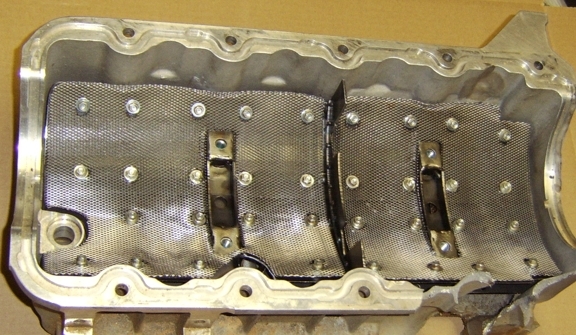 The lower baffle creates a de facto second sump when the engine is under prevailing lateral accelerations. 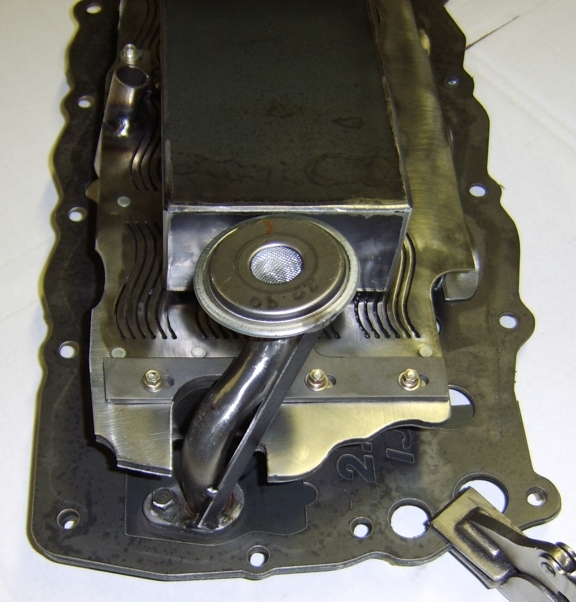 Typically these sumps are found in vehicles generating well over 1G of lateral acceleration (45 degree angle for the oil in the sump) and during braking. 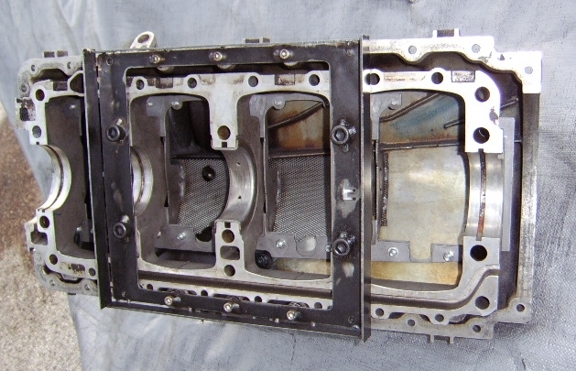 The oil collects along the sides and in the corners and cannot return to the lower part of the casting. 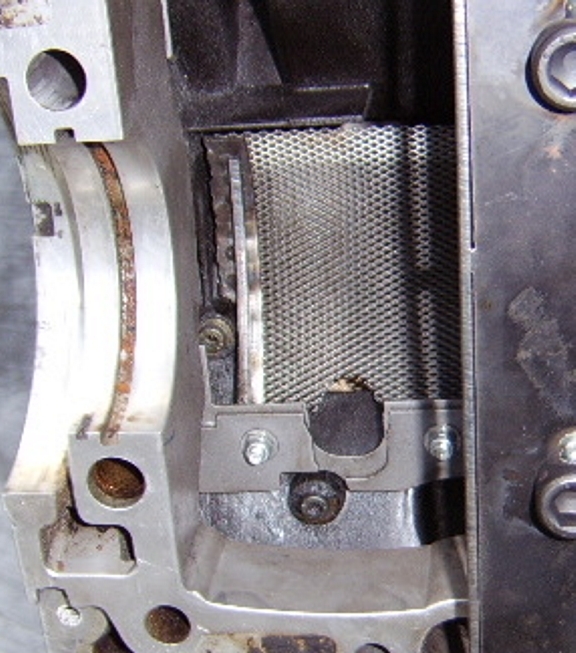 When enough oil collects the oil floods the upper windage tray and is churned by the rotating assembly. 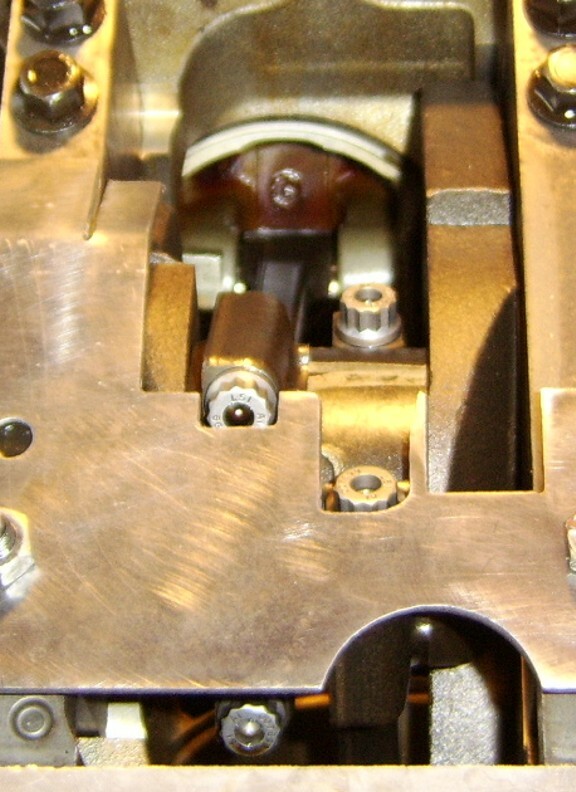 An ingenious oil pickup is employed that removes it from interfering with the rotating assembly and still places it in an ideal central location. 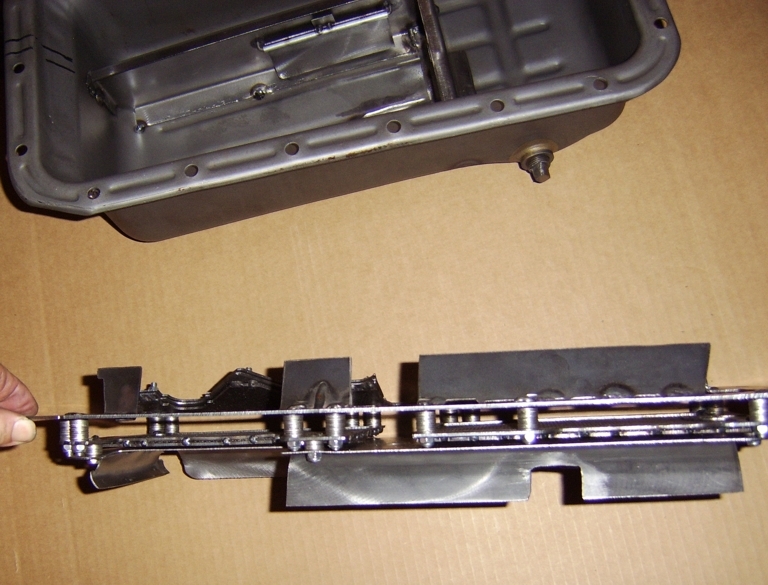 One drawback is that the pickup tube is not equipped with a mesh filter to stop large items from being ingested by the oil pump. 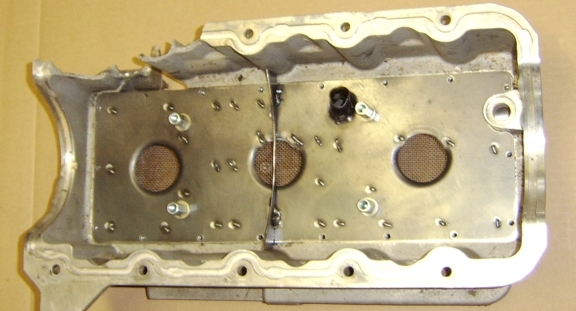 The parts have larger drain back holes. 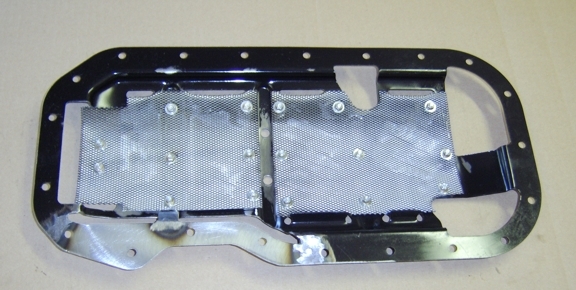 These holes have mesh screening that acts to filter the oil prior to its returning to the lower sump. 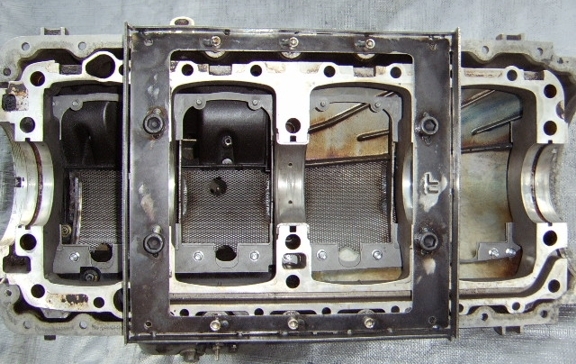 Triumph employed this general technique in the Mark 1 2000 straight six and Porsche in the original 928 wet sump design. 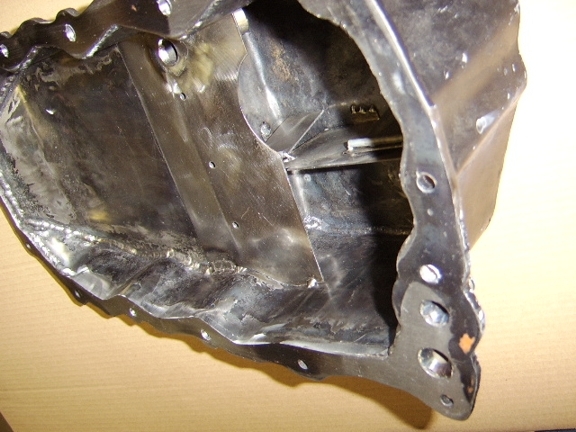 The dipstick hole has a high collar welded around it that acts as both a guide and to ward against detritus using this opening as a passageway to the lower sump. 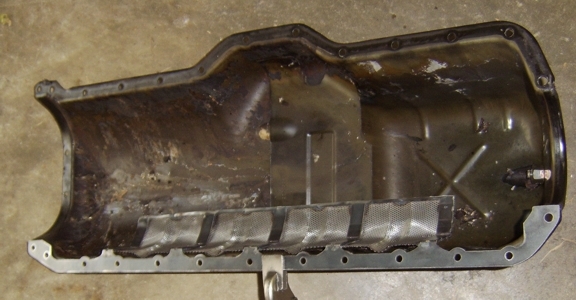 The lower tray also has a central baffle that acts to shunt oil traveling along the walls and floor of the sump prior to its collecting in the corner. 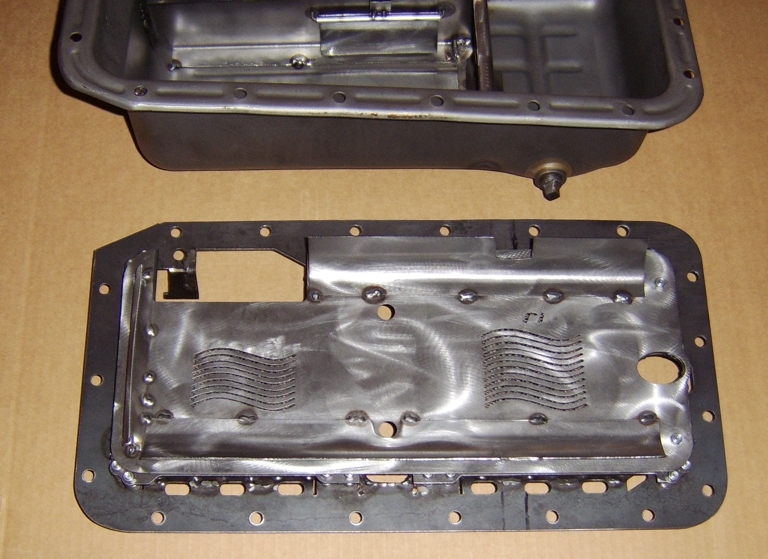 This will also help feed the oil pump as the central chamber contains the pickup opening. 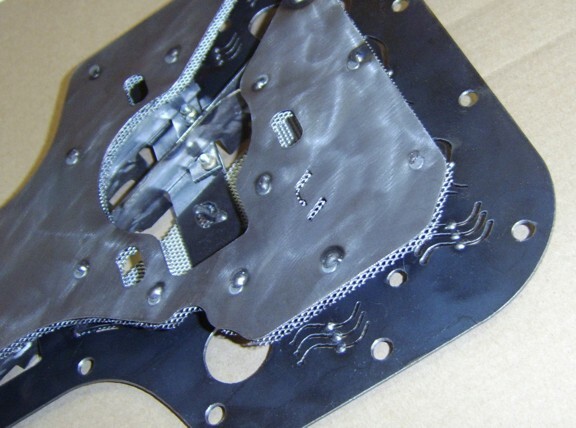 The upper windage tray has a solid surface beneath to help stop oil from splashing onto the rotating assembly and a directional screening layer on top to grab high speed oil droplets and let them drain through. 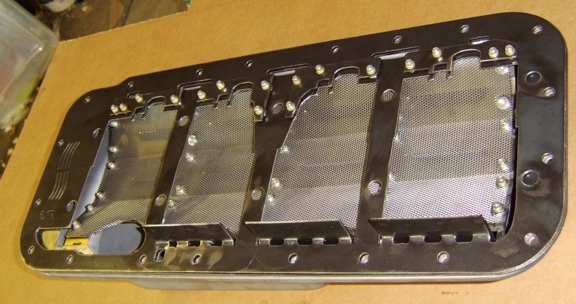 The center of the tray has a vertical baffle to encourage balanced pumping exchanges between bays 1-2 and 3-4. 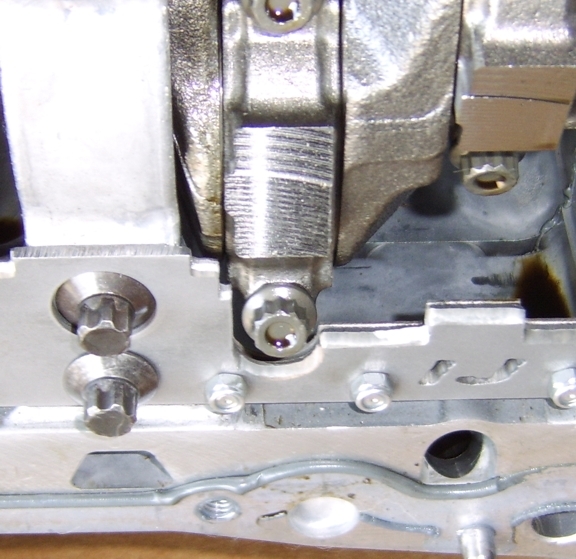 This also helps hinder entrained oil in a windage cloud from migrating fore and aft in the engine. 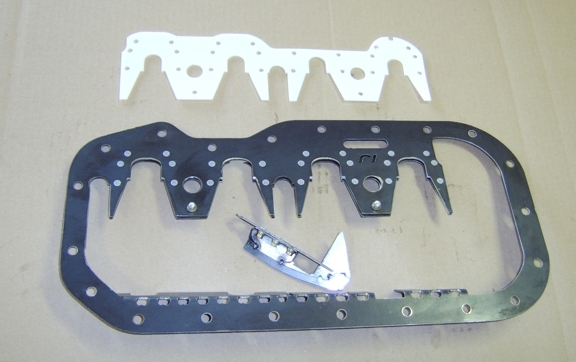 These parts are designed to work in combination with the oil scraper sets that we make for the Zetec engine if that is desired. 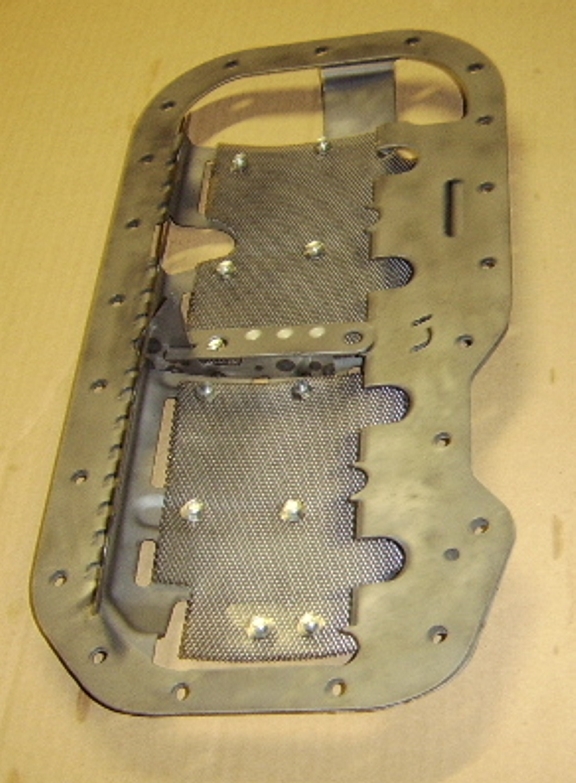 There are scrapers and modified stock windage trays available. 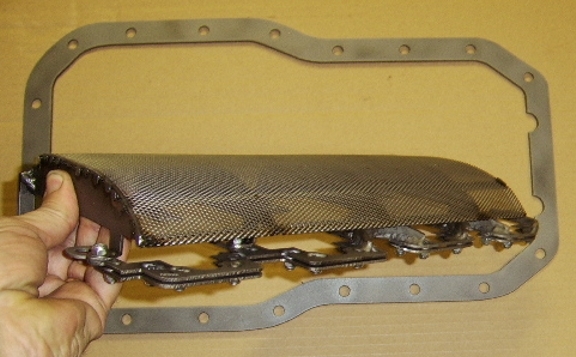 The tray shown is GM part number 12558189 which is the full length one. 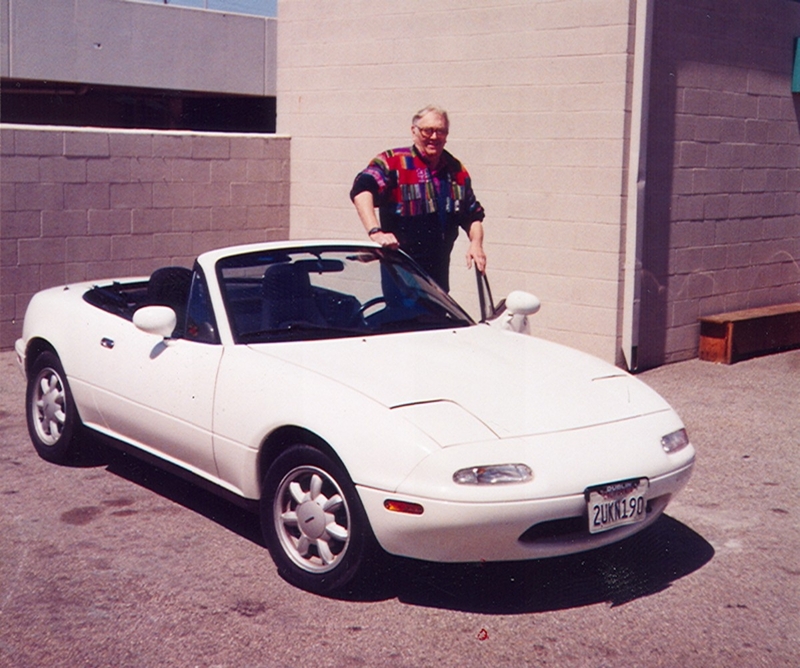 There are multiple stock patterns that the same general modifications can be performed on. The principal aims were to introduce a small amount of additional order to the windage flow and to extract more entrained oil from the cloud. 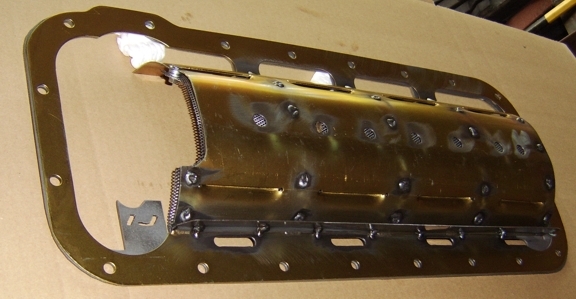 A divider was used in the center to encourage the flow pattern to circulate in bays 1-2 and 3-4 rather than simply have chaotic flow over the third main. The louvers were extended inward on the downstroke side and then had this element transition into directional screening on the floor. 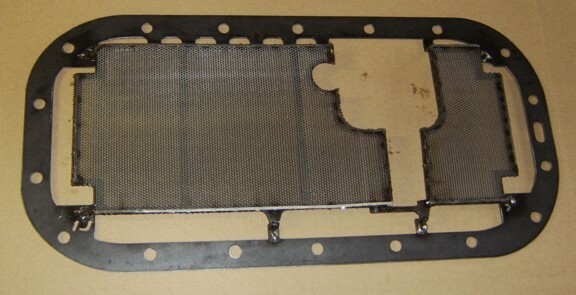 This screening rises above the lowest louver on the opposite side of the tray. 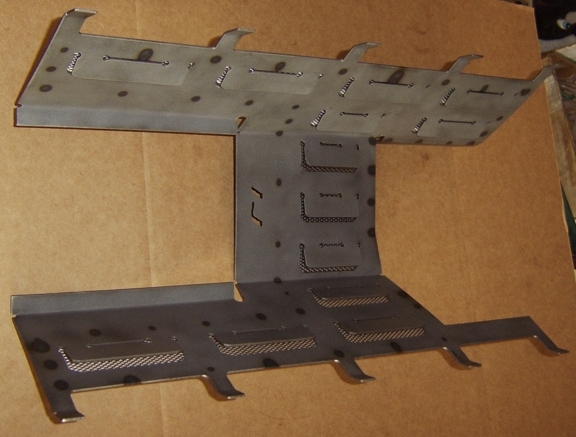 This transforms the lowest louver openings into drains (additional drain holes drilled as well). 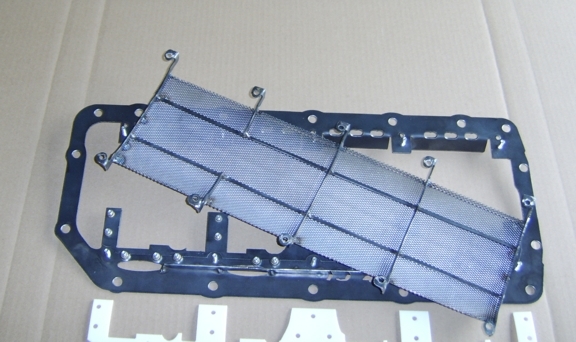 However, because of the orientation of the screening openings (iterated small louvers) the total amount of "louvered" area is greatly increased. 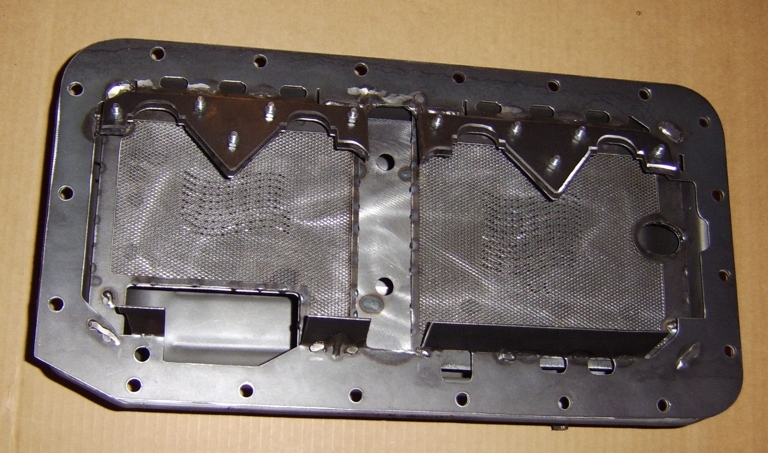 The screening helps prevent oil from bouncing back up after striking the interior tray surface and protects oil that has passed through it and is then flowing out of the tray. 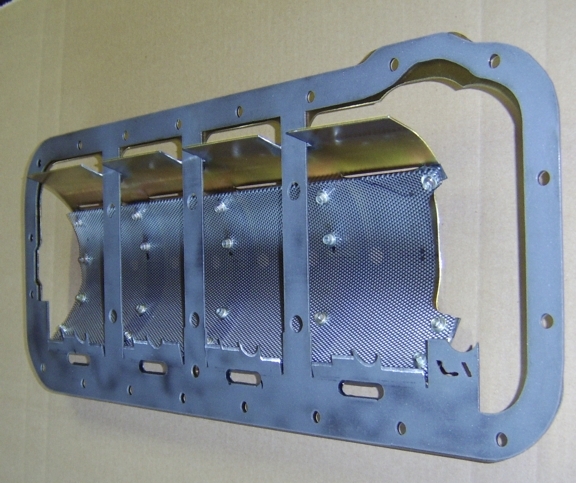 The uppermost upstroke louvers have been opened up a bit and the scraper serves as a new and far closer edge to guide stripped oil into those openings and also to reach in and disrupt the pressure differential of the windage cloud. 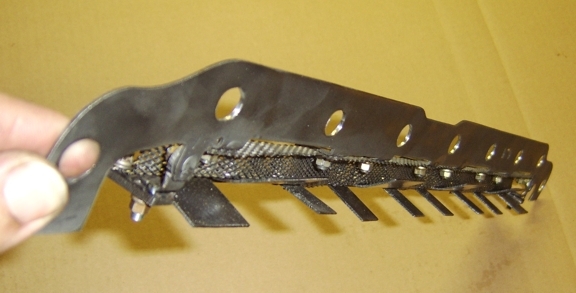 The scraper moves the windage tray approximately 1.5mm closer to the floor of the pan. 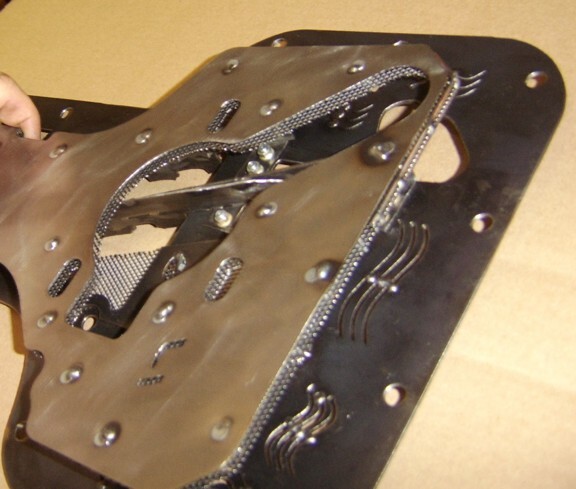 Overall, this is an enhancement of the original design going beyond what is possible with a single stamped piece of metal. 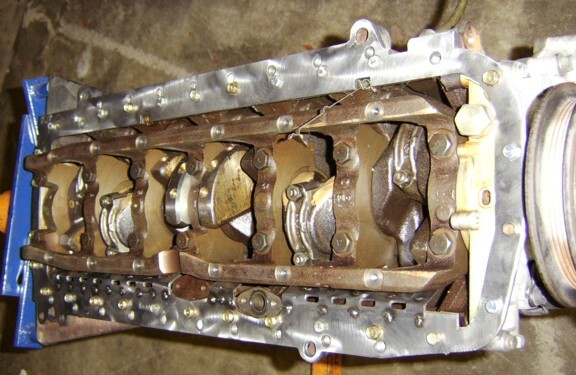 It is thought that the destruction of these engines at high G's is mostly due to oil migrating into the rotating assembly and being trapped by the windage tray and the network of passages through and over the mains/webbing. 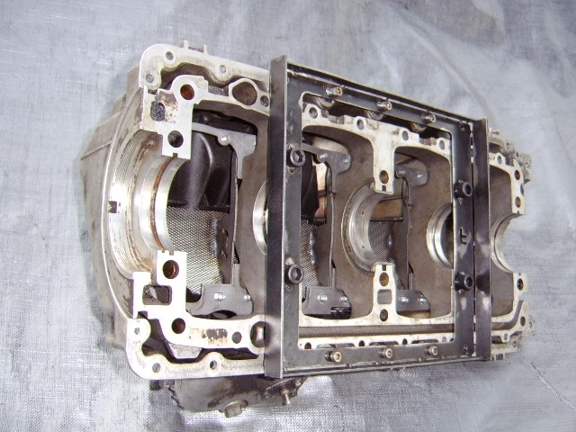 It becomes churned full of air before being ejected and this increased aeration is what kills the bearings. Entrained air requires more time to be released than simple foaming on the surface. 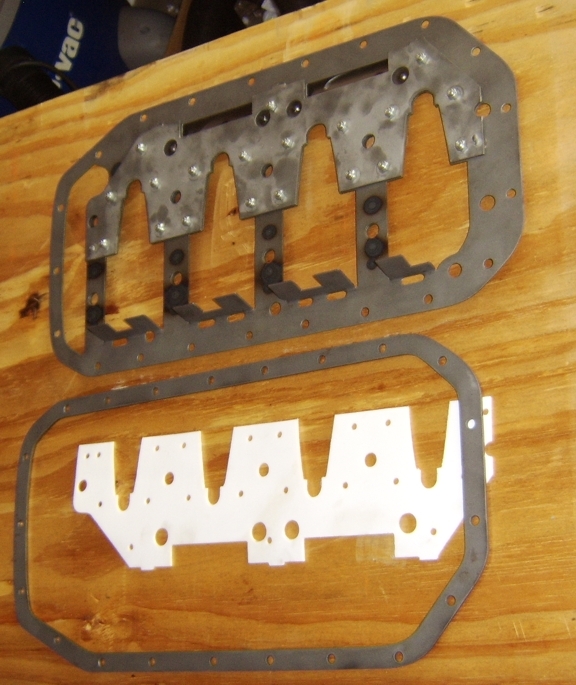 The scraper and modified tray helps to more quickly extract this oil while still allowing pumping exchanges between cylinders and bays. 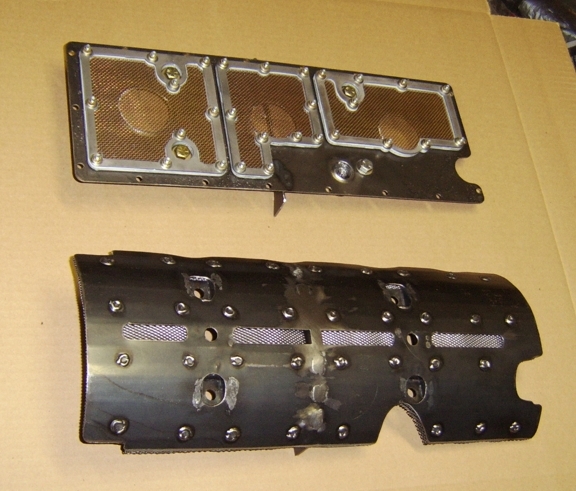 The scraper and tray can be used independently of one another if desired. 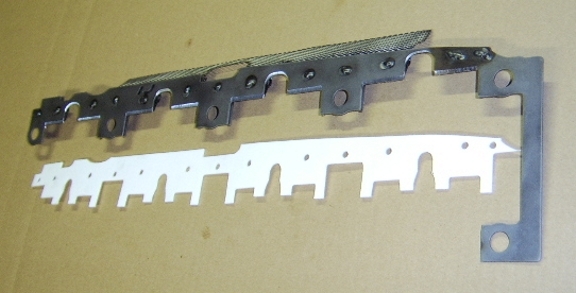 Stroker and Teflon bladed versions of the scraper are available. 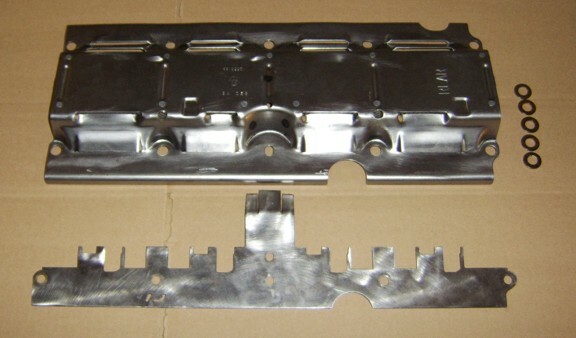 Important note: If you want a tray to be modified for use in a stroker engine you must fit the stock one to your rotating assembly and then send it to us. 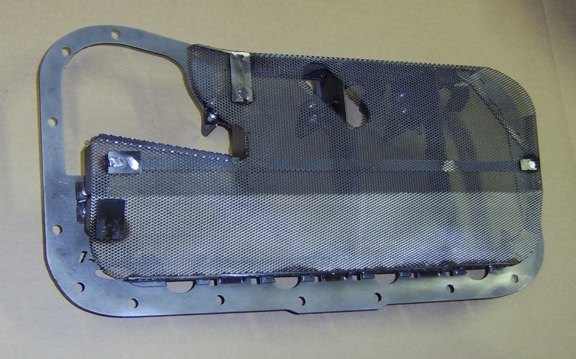 A racer in Canada recently requested a dual Teflon scraper and windage tray for his Volvo B20 engine. 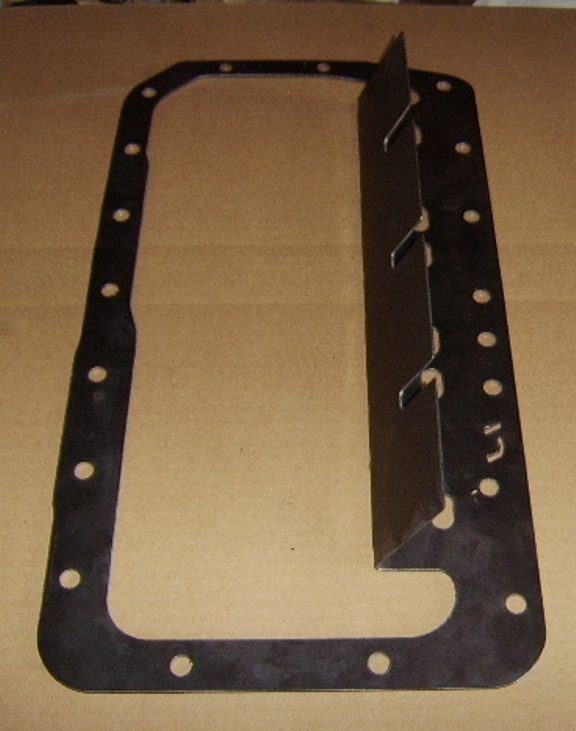 The windage tray design was adjusted from a previous version to accommodate the drain ports on the downstroke side of the block. 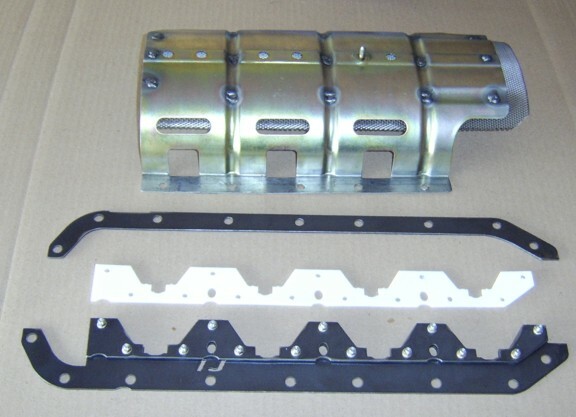 The windage tray is designed to work with or without the scraper and is set up to be used on the B20, B21, B23, B230 and similar engines. Provisions are present for two different dipstick locations. 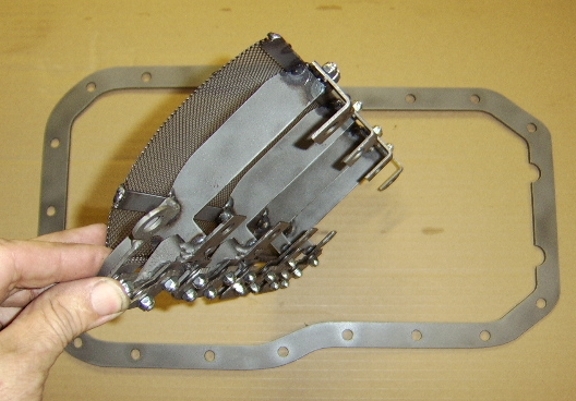 Above and below: the tray nested with the Teflon dual scraper framework. 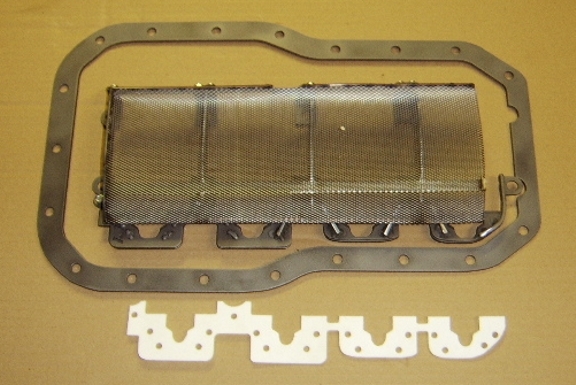 Below: the Teflon dual scraper framework and insert. 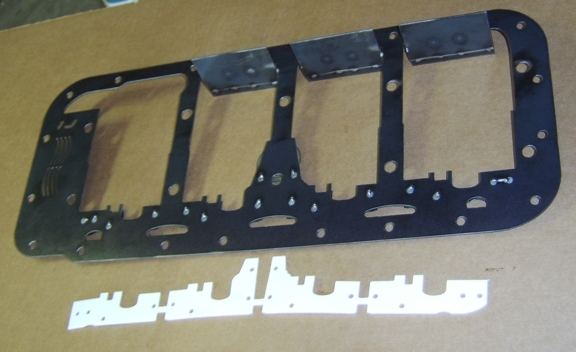 One of our customers was kind enough to ship us a block to enable us to design this product. 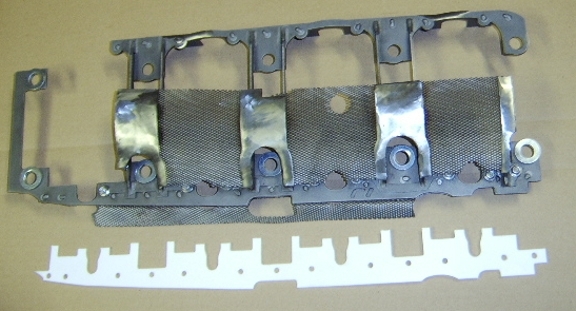 For clarity, the stock windage trays normally covering the girdle have been removed as well as the pickup tube. We also have a pattern for the RB25. 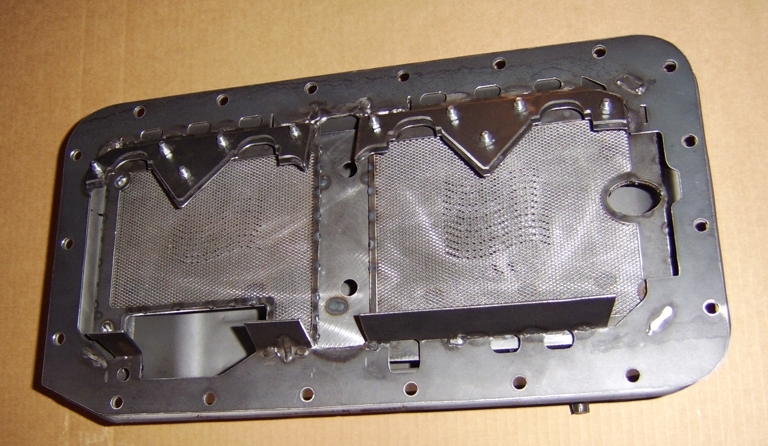 Above and below: the stock insert shape has a layer of suspended directional screening to dissipate the energy of high speed oil droplets expelled and/or stripped from the rotating assembly. 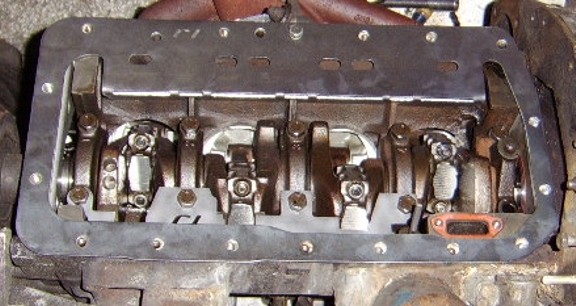 It is shown positioned over our crank scraper pattern for these two engines. 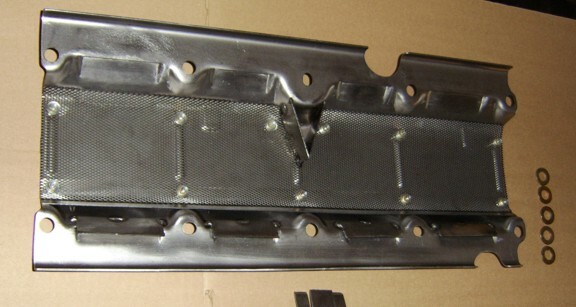 When we first made scrapers for the Mazda Miata 1.8 they were positioned along the pan rail. 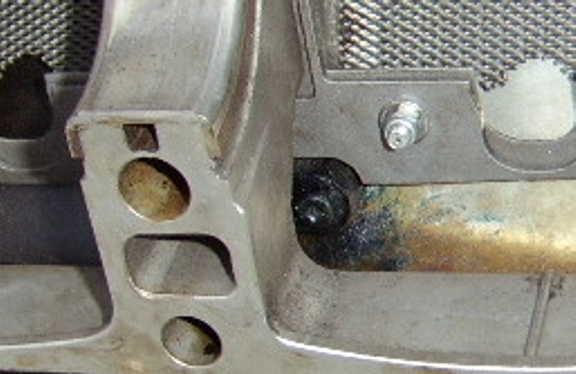 They are now located along the main bearing caps. 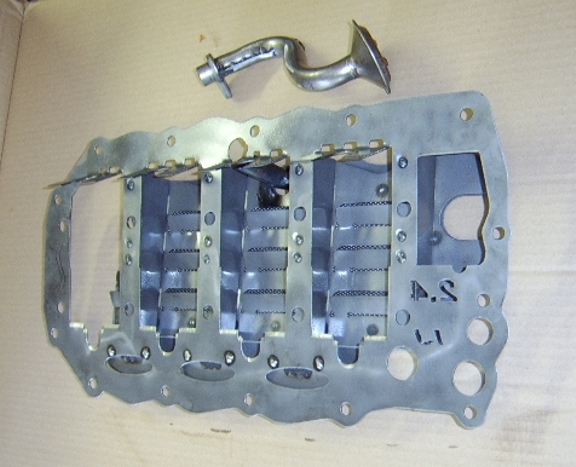 A racer contacted us who had engine blocks and pans that were specially machined to accept this earlier design. 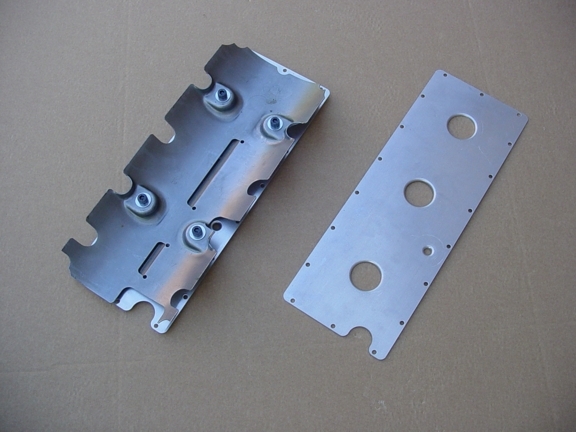 In support of our customer, we designed a Teflon bladed version, furthermore for a knife-edged crankshaft. 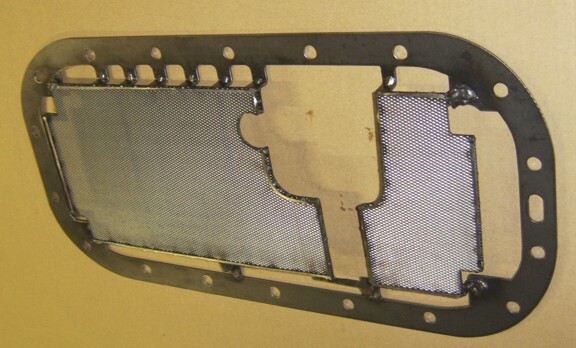 In addition to wanting a Teflon bladed scraper he wanted us to add directional screening to the interior of his stock windage tray. 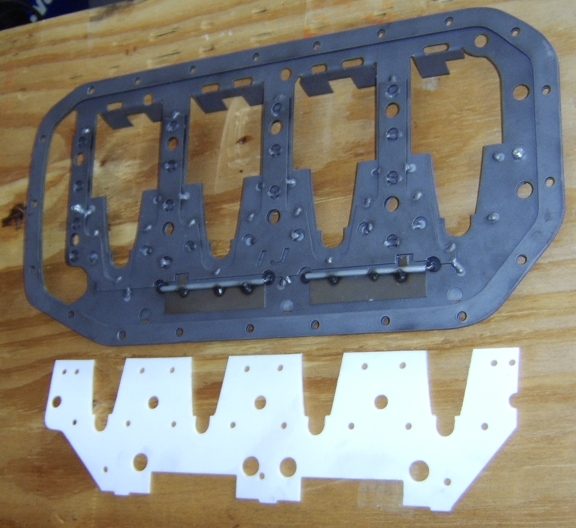 This design is certainly effective and we moved away from it only because it required some adjustments in order to achieve good mating between the transmission bellhousing and oil pan. The new design along the main caps has been in place on cars winning national SCCA championships. This older -- but supported --design should be strongly considered if you are using aftermarket main bearing caps or modified OEM ones.